After a long flight from the U.S., the mission team arrived in Nairobi, Kenya late in the evening. From that point forward it was non-stop. 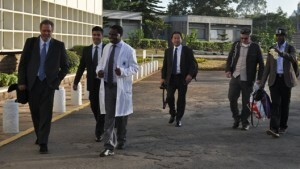 Every morning, the team woke up early and got on the road to Kenyatta National Hospital (KNH). The 15 kilometer drive took them 2 hours at times in the horrific local traffic. 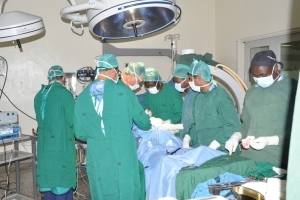 KNH is a large university hospital that consistently houses over 2000 patients. The hospital has 50 wards, 22 out-patient clinics, 24 theatres (16 specialized), and an Accident & Emergency Department. 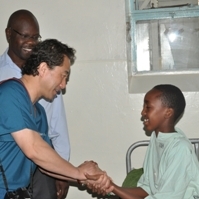 Upon arrival at KNH the team was greeted by local surgeons, Dr. Richard Ombachi and Dr. Soren Otieno. The day started with an insightful and collaborative meeting with the CEO of KNH, Richard Lesiyampe. The group discussed the NuVasive Spine Foundation™ (NSF) and their objectives for this mission trip: transferring knowledge to the local surgeons and providing life-changing spine surgery to those in need. 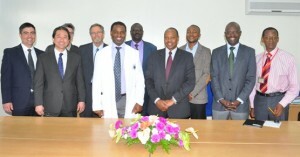 They also discussed the ongoing partnership and engagement between the NSF and KNH. After a successful meeting, the local surgeons escorted the team down to the Clinical Ward where they began a full-day of patient screening. The U.S. Team along with five local Kenyan surgeons and five to ten residents gathered in a very small room and triaged 52 total patients in one day. 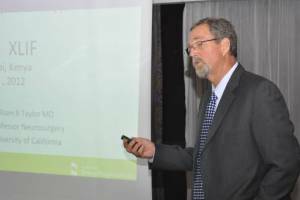 The Kenya Orthopedic Association meeting happened to be taking place that evening and the U.S. team had the opportunity to attend it. At the meeting, Dr. William Taylor presented on a few important topics, including Decision Making, Degenerative Disease in Lumbar Spine, and an Introduction to XLIF® (eXtreme Lateral Interbody Fusion). three full days of surgery ahead. 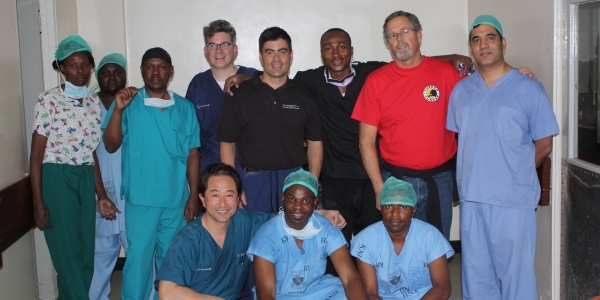 Three days, 36 hours in the OR, 11 cages, and 84 screws later the team had successfully performed life-changing spine surgery on 12 patients and taught the local surgeons surgical techniques and decision making discussions to help continue their education and development. Each patient has a story and we look forward to sharing them with you as we follow up and learn more about how their spine surgery has given them a new chance at life.